Description: Combining the insights of many leading New Testament scholars writing on the use of social identity theory this new reference work provides a comprehensive handbook to the construction of social identity in the New Testament. Part one examines key methodological issues and the ways in which scholars have viewed and studied social identity, including different theoretical approaches, and core areas or topics which may be used in the study of social identity, such as food, social memory, and ancient media culture. Part two presents worked examples and in-depth textual studies covering core passages from each of the New Testament books, as they relate to the construction of social identity. Adopting a case-study approach, in line with sociological methods the volume builds a picture of how identity was structured in the earliest Christ-movement. Contributors include; Philip Esler, Warren Carter, Paul Middleton, Rafael Rodriquez, and Robert Brawley. 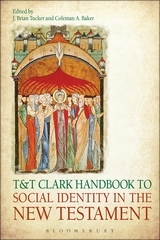 Citation: Jacobus (Kobus) Kok, review of J. Brian Tucker and Coleman A. Baker, eds., T&T Clark Handbook to Social Identity in the New Testament, Review of Biblical Literature [http://www.bookreviews.org] (2015).